From March 21 to April 1, 2011, Evangelism and Discipleship session took place in Chisinau within the Inductive Bible Study Institute of Moldova. Studying this topic, to help students to effectively evangelize and make disciples, we decided to make a poll to identify the current situation. Because most of the students participating at this session were members of Baptist churches, we decided to interview the Christians of this denomination. The 30 students participating at the session were able to interview 242 people from 30 localities of the country. 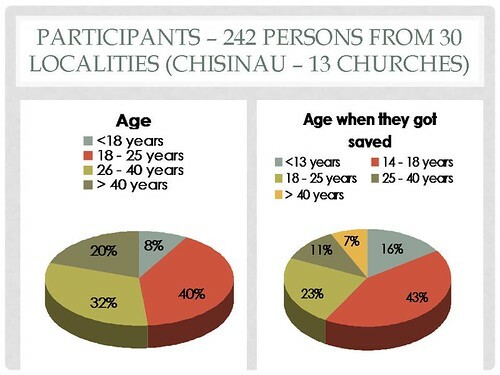 Christians who were interviewed in Chisinau are members of 13 churches from the city. 40% of the Baptist Christian respondents were between 18-25 years old, being followed by 32% of people who were between 26-40 years old. Those who are over 40 years made up 20% and below 18 years – 8%. Most of those interviewed – 43% have made a covenant with the Lord Jesus Christ when they were 14-18 years, 23% were aged 18-25 when they repented. Those who were under 13 when they experienced the new birth make up 16%. Worldwide statistics show that 80% of Christians have decided to follow Christ in this age. The fact that this percentage is small highlights a need to share the Gospel with as many children under the age of 14 years as possible. 11% of respondents have become Christians when they were 25-40 years and only 7% after 40 years. Whom they have heard the Gospel from? 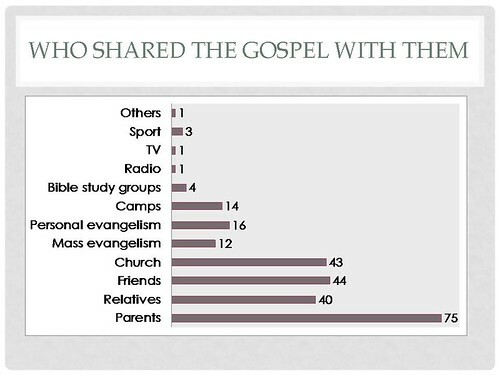 Most of the Christians who were interviewed had heard the Gospel from their parents. Their number is 75 people. 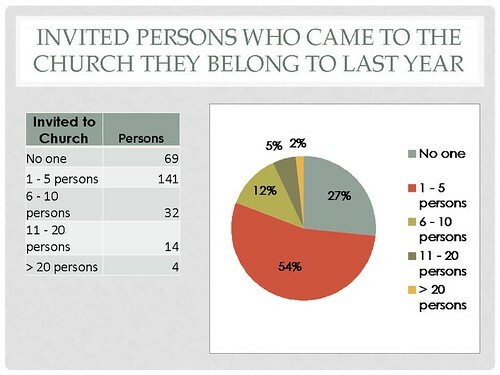 44 have heard from friends, 43 when they visited church services, and 40 – from relatives. The next group consists of those who have repented by hearing the gospel through personal evangelism, 14 – at camps and 12 – at mass evangelism, such as the one where Franklin Graham preached. By various Christian sports ministry 3 people have come to Christ and a person through TV and Radio. One person did not specify the way he returned to God. How many people have they led to Christ since they entered the New Covenant? Every second interviewed person (50%) led to Christ from 1 to 5 people and it is an encouraging figure. It is sad, however, that every third person (32%) did not lead anyone to Christ. 25 of the interviewed Baptists led to Christ from 6 to 10 people, and those who led to salvation from 11 to 20 persons make up 4%. 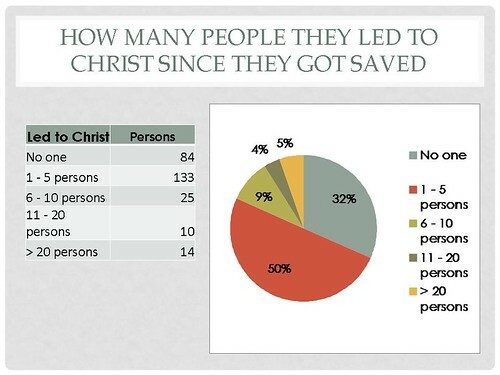 14 Christians (5%) led to Christ more than 20 people. How we can help each of the third Christian in the church that has not led anyone to Christ to be a living witness? How many people have they shared the Gospel with last week? When asked how many people they shared the Gospel with last week, the interviewed Christians gave answers, that are very similar to those showing the number of the people turned to Christ through their testimony. Thus, 52% have proclaimed the Gospel to 1-5 people in the last 7 days. 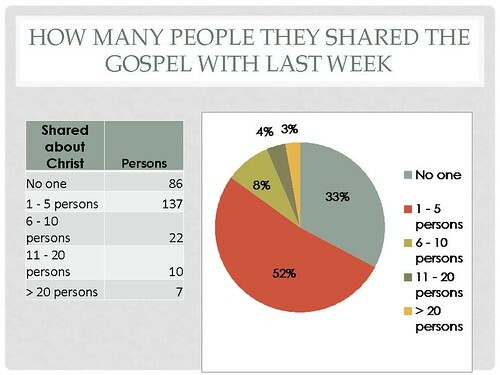 8% shared the Word with 6 to 10 people, 4% evangelized from 11 to 20 people and 3% said the Good News to over 20 people. It is sad that every third Christian did not tell anyone about the Savior the last week. Because many people received the Gospel when they were invited to worship services of the church, we wanted to hear from those interviewed how many people invited to the church last year and they came. 54% of Christians invited from 1 to 5 persons, 12% invited from 6 to 10, 5% invited 11 to 20 and 2% invited over 20 people. 27%, which is more than one out of every fourth Christian did not invite anyone to their church last year. When asked what prevents them to preach the Gospel to more people, 35% of respondents mentioned embarrassment, while 28% said they did not have time … But, what’s then the point of all their time if they do not use it according to the call they have received from the Savior to proclaim the awesome power of Him who called us out of darkness into His marvelous light? 16% said they did not know how and this shows the need for discipleship in churches. 14% were discouraged by previous failures. 4% of respondents did not want specific things that prevent them from being active witnesses of Jesus Christ, and 3% said they have no barrier and we want to believe that they preach the gospel to everyone. Studying Scripture is a necessary and very important part of a healthy Christian life. 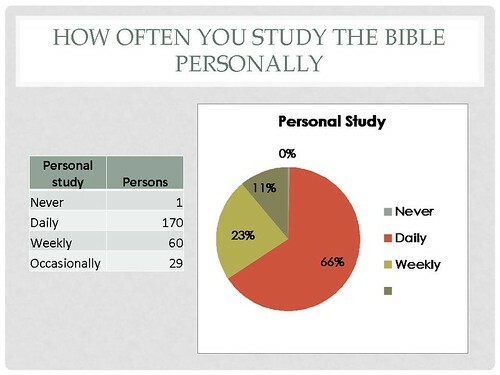 When asked, each two out of three Baptists (66% of respondents) said they read the Bible daily, 23% read it weekly, 11% – occasionally and only one person said he never reads it. Bible study requires knowledge of certain skills. 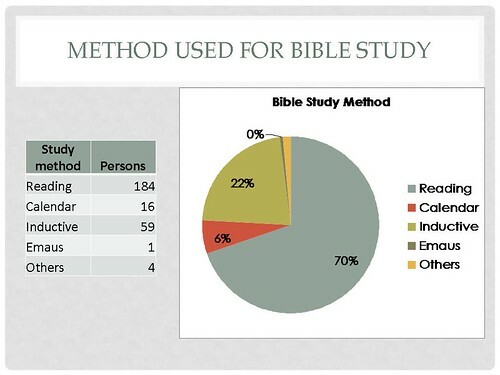 The survey showed that 70% of Christians limit themselves to reading, 22%, which means more than one out of five Christians study it using the inductive method, 6% study the Bible reading according to the calendar of the Bible and 2% have undersigned the “other courses” without specifying the method. One person said that she studies the “Emmaus” course. The fact that only 30% of respondents study the Bible in the family indicates an urgent need to focus emphasis on this thing in the Church. 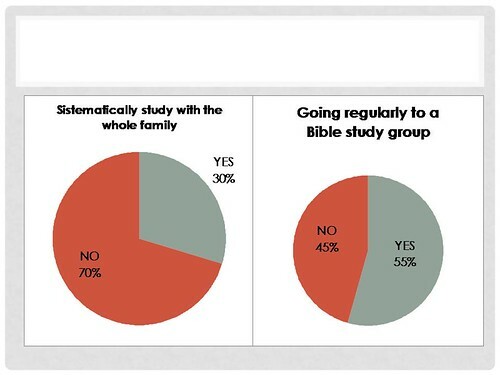 It is still a need to involve Christians in Bible study groups, because 45% of respondents do not go to any small group. I thank all students who have made the effort to collect the data for this survey and I also thank Nicolae Toncu for structuring and presenting the results graphically.